aka "AI to the People"
The project that asks the question: If computer vision technology can be used to detect when you look like a terrorist, criminal, or other "undesirable" - why not when you look like a rock star? 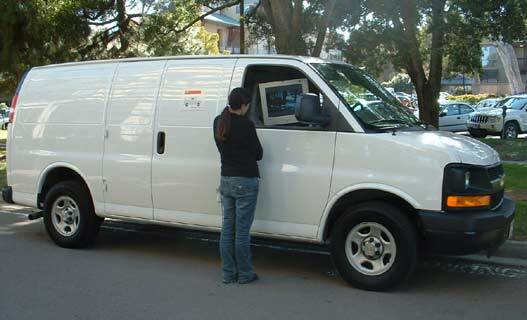 SVEN (Surveillance Video Entertainment Network) is a system comprised of a camera, monitor, and two computers that can be set up in public places - especially in situations where a CCTV monitor might be expected. 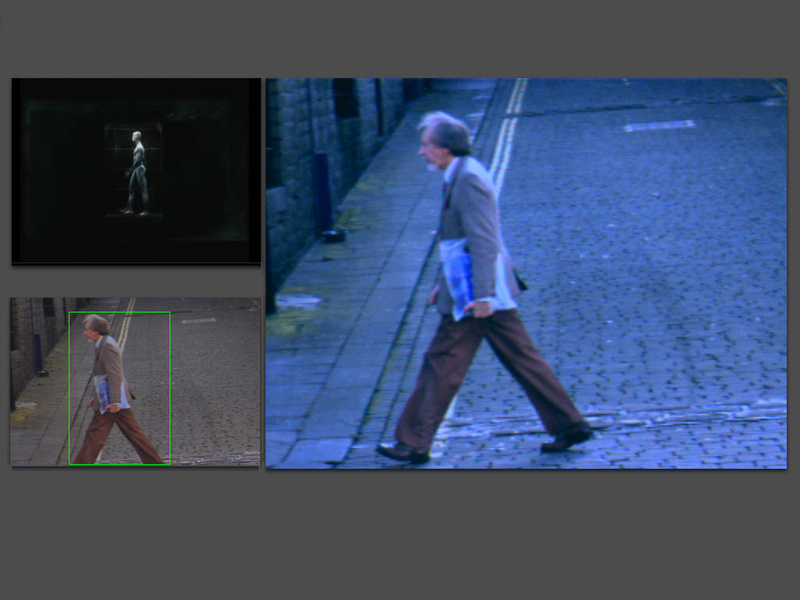 The software consists of a custom computer vision application that tracks pedestrians and detects their characteristics, and a real-time video processing application that receives this information and uses it to generate music-video like visuals from the live camera feed. 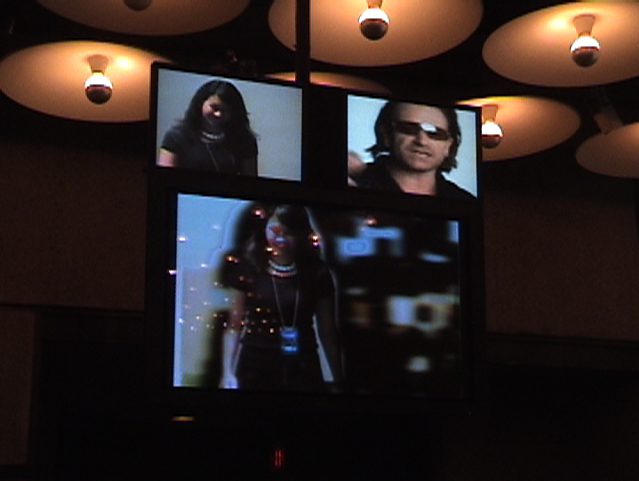 The resulting video and audio are displayed on a monitor in the public space, interrupting the standard security camera type display each time a potential rock star is detected. The idea is to humorously examine and demystify concerns about surveillance and computer systems not in terms of being watched, but in terms of how the watching is being done - and how else it might be done if other people were at the wheel..
SVEN v 2.0 - as an installation, detecting rockstars in the corridors of the Whitney Museum in New York, Summer 2007. If streaming doesn't work, download the video (56MB). SVEN videos require Quicktime 7 (except from YouTube). If streaming doesn't work, download the video (25MB). SVAN videos require Quicktime 7 (except from YouTube). 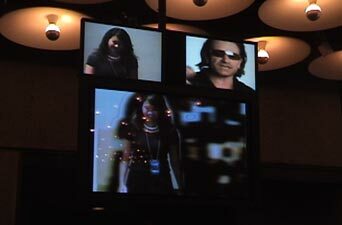 Additional video programming by Jesse Gilbert; additional computer vision programming by Nikhil Rasiwasia; additional utility programming by Cristyn Magnus; additional production assistance by Annina Rüst. Production of SVEN/AI to the People was begun at the Digital Research Unit, Huddersfield, UK. The project is also supported by UC Institute for Research in the Arts, Calit2, UCSD Center for the Humanities, UCSD Center for Research in Computing and the Arts (CRCA), The Hellman Fellowship Program at UCSD and UCSD Academic Senate.